What were the consequences of the Indian Removal Act of 1830? What historic place might you study to answer this question? By the end of the 1830s, the U.S. government forced or coerced an estimated 100,000 American Indians to move from their homelands in the southeast to distant Reservations. These people included members of the Cherokee, Choctaw, Chickasaw, Creek, and Seminole Nations. They traveled many different paths, but share a story. The Trail of Tears today is a cultural and physical landscape that tells that story. It has the power to teach why and how the majority of people from these Nations moved from their homes in parts of North Carolina, Tennessee, Georgia, and Alabama to Indian Territory in present-day Oklahoma. This lesson emphasizes the struggle for Cherokee members to hold on to their land, government, and culture in the face of overwhelming pressure. The Cherokee Nation’s journey occurred between 1838 and 1839. In this lesson, students investigate a complicated story about how indigenous people negotiated through law and culture to preserve their identities. They will analyze pro-relocation and anti-relocation perspectives. The historic Major Ridge House in Georgia and the National Park Service’s Trail of Tears National Historic Trail tell the histories of Cherokee Indian forced relocation. At a time when the Cherokee struggled to keep their nation in the east, a Cherokee leader named Major Ridge supported moving west. Historic places like the Major Ridge House provide evidence of Cherokee experiences and of the United States' policy of American Indian removal. The materials here introduce students to these topics through evidence-based investigations and skill-building exercises. This lesson could be a part of a history unit on American Indians, Jacksonian America, Manifest Destiny, or westward expansion, a social studies unit on cultural diversity, or a geography unit on demography. 2. To trace the paths Cherokee Indians traveled during the “Trail of Tears” and to theorize what challenges they faced during the journey west. • US History Era 4, Standard 1B: The student understands federal and state Native American policy and the strategies for survival by Native Americans. • US History Era 4, Standard 2E: The student understands the settlement of the West..
Map 1: Cherokee Removal Routes, 1838-1839. Reading 1: “You cannot remain where you are now”: Cherokee Resistance and Relocation in the 1830s. Photo 1: The Major Ridge House and Chieftains Museum, 2008. Download the Full Lesson (PDF) to access these post-lesson activities. These are intended to deepen your students' engagement with the topics and themes introduced in the lesson, and to help them develop essential skills. 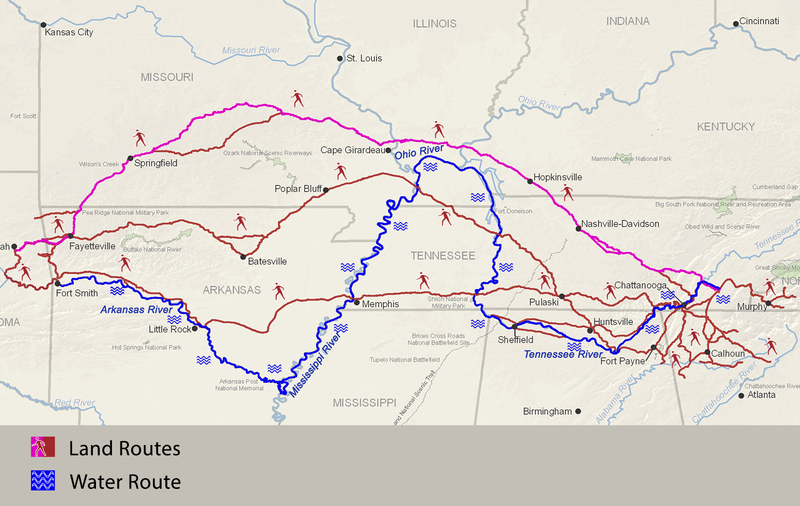 The National Park Service manages portions of the trail through the Trail of Tears National Historic Trail. The Agency website provides online visitors with information about Relocation history and where to visit historic places in person. Teach similar skills and topics with this longer TwHP lesson plan about Cherokee relocation. This lesson includes additional skill-building investigations and unique materials, including primary sources about the historic John Ross House and Rattlesnake Springs in Tennesee. This lesson was published in 2004 and the Trail of Tears Lightning Lesson is based on it. The Cherokee Nation (a federally recognized tribe) offers online resources on the history of the Cherokee, including the Trail of Tears, and contemporary concerns at its official tribal website. The Eastern Band of Cherokee Indians (a federally recognized tribe) provides contemporary concerns at its tribal website and information about its culture and history at websites for the Museum of the Cherokee Indian and Cherokee Preservation Foundation. The United Keetoowah Band of Cherokee Indians (a federally recognized tribe) offers online essays about Cherokee history and resources to study its cultural heritage here or click here to visit the UKB ‘John Hair Cultural Center and Museum’ website. The Museum of the Cherokee Indian offers workshops, exhibits, and events that commemorate Cherokee history. Information on the museum can be found online. The Cherokee Heritage Center was created by the Cherokee National Historical Society and offers resources for the study and preservation of the history of the Cherokee. Discover the Center's mission and learn more about Cherokee culture through its website. The Trail of Tears Association offers online resources and background information on the Trail of Tears through their website. While providing history, the Association site also contains links to external websites for the different indigenous groups that experienced Trail of Tears. The Major Ridge Home is also home to the Chieftains Museum and their website offers a wealth of information about the man himself, along with history of the property and of the broader Cherokee experience. The Library of Congress houses a collection of primary documents pertaining to the Indian Removal Act which is in direct relation to the Trail of Tears. These documents can be found on the LOC website. This National Park Service lesson plan is based on the National Register of Historic Places nomination for “Chieftains;” Major Ridge House in Rome, Georgia. The lesson plan was published in 2018. This lesson was written by education consultant Kathleen Hunter and National Park Service historian Katie Orr, with assistance from consultants Sarah Curtis and Marilyn Harper. The Chieftains Museum staff provided additional feedback on drafts. It was produced by NPS Cultural Resources staff in Washington, DC. Discover the Trail of Tears: A Lightning Lesson from Teaching with Historic Places is based on the earlier Teaching with Historic Places publication, The Trail of Tears and the Forced Relocation of the Cherokee Nation published in 2004. Redeveloped and keeping the place-as-evidence model, it is designed to fit within a 60-minute block and is aligned with Common Core standards. This lesson is one in a series that brings the power of place and historic sites to students around the world.